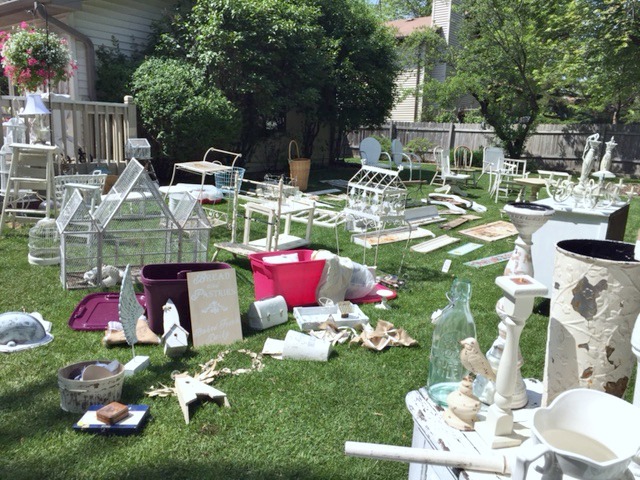 Junk Chic Cottage: My Junk could be Lucky Junk!!! I have been cleaning out storage closets and the outdoor shed and have enough stuff I think to open my own shop!!!! Since I am not planning on opening my own shop and have friends that have shops, I decided to invite my friend Janet from Lucky Junk over to see if any of this stuff might become "lucky junk" in her shop. She is coming by to take a look at all the stuff. Hope she takes it all lol! I pretty much filled up my backyard. 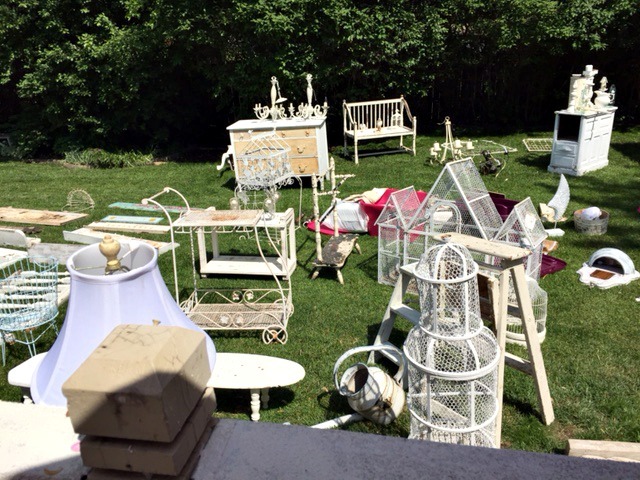 I have birdcages, vintage ladders, chairs, chandeliers, chippy pieces of furniture. 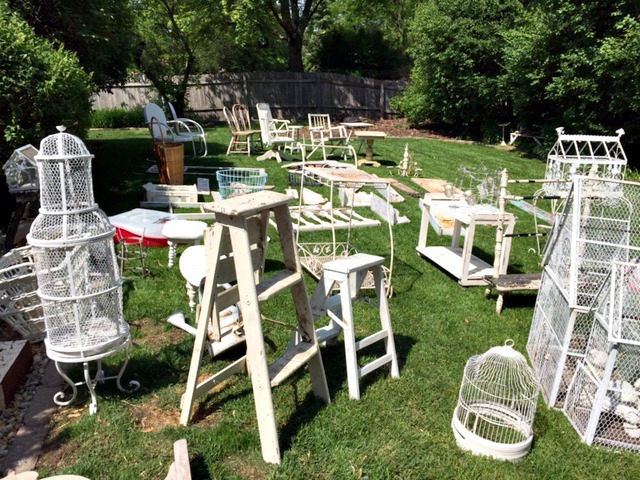 Tons of bottles, candle stick, iron stone and lamps signs. You name it I probably have it in the pile. Whatever Janet does not take for her shop will go to Goodwill. Depending on where Terry lands a job I may have to sell more of the inside things if we have to move and sell our home. So time will tell with all the treasures inside my house too. Just can't go there yet. It feels good to think Janet might be able to use some of these treasures for her shop. Wow...wish I lived close enough to come shop your "junk"! Those gates in the last photo are big sellers at our shop. Wow! Wish I lived closer. I would love to come buy some of your stuff. Lots of nice treasures. OMG!! Wish I lived closer so I could come and shop!! Oh Kris, I see so many wonderful things I would love to purchase! I do wish that I lived closer to you, I would be there shortly!! :-) Your treasures will definitely put a smile on someone's face!! Have a great day! Oh my heavens, Kris! You have some great treasures there!! I'm sure your friends will take them off your hands and soon! I wish I lived near you, I'd help!! You are kidding me!! I want one of those gates. Darn....I wish you weren't so far away but I hope you are successful. That's a lot of stuff to have stashed in your house. You have a wonderful supply of treasures! I bet she takes them all! You have some great "junk" Kris-I wish I could take some off your hands! Oh my sweet friend, WOW so many intriguing items all on your lawn. The wire three peaked piece it is an aviary cage, correct? It's incrediable and I am sure your friend Janet's eyes will open wide and do a lot of smiling filling up her truck! Funny everytime I free myself of things and let go something meaningful and never expected enters my life. We always donate to Restor the Habitat for Humanity store, hmmm Goodwill will be receiving some items from me soon. Kris I really believe Terry will be offered a position with people who embrace you and fill your heart's with joy. Hi Kris! I'm coming over and claiming those 2 wonderful garden gates! ;) Your stash is awesome! Wish I lived close by..I see some great things I would love to have. omg so many yummy goodness!!! If I were closer, I would be all over that. Oh I am sure she will want it all. Fabulous. Wow Kris you have so much and hope your friend will take a lot of it from you! Good luck with it all! I too love the birdcage. Have great day and thanks for the sweet comment on my coasters! Oh, I wish I could be there shopping in your back yard. I want a gate for my garden. Kris, why do I not have a neighbor like you? Better yet why am I not your neighbor?? I would take those old gates off your hands for areas in my garden.... And a couple of those bird averies too... Are you sure some of those cages couldn't be nested in your yard tucked in here and there amoungest the plantings? As you can tell from the comments, the pickings would be pretty slim after your blog friends visited your yard in person! Everything looks sparkling clean too. It feels good to pass things along, doesn't it? I know it's a lot of work, but you could make a killing on Etsy or Ebay. My sister starting selling a few items she wanted to get rid of and it all went lickity split, with people clamoring for more. It's actually become and unintentional job. I bet your friend will take it all...I would! Oh how I wished I lived close, see so many great items in your stash. If Janet doesn't take any, you should have a blogger garage sale. I am sure you would make a lot of money. I pray that Terry lands a job where you do not have to move. Hope you had a grand time in Florida visiting your mother. Take care dear friend, I am sure everything will work out. Hope your feeling terrific. Wow! If I lived close enough, I'd make sure I beat Janet to your sale. I'm sure you won't have anything left. I could SO SHOP your YARD! I think you should have a yard sale and not donate until then!!! Loving the birdcages!!! Wow! Everything fabulous! Especially the birdcages. You should have a sale Kris!! Beautiful junk!! Oh Kris, you have a yard of treasures. I wish I lived near by. A sale would be fabulous before donating. Best wishes to your hubby on the job search. Janet is going to have lots of fun. Lucky girl!! I would come buy as much as possible if I lived close. Oklahoma is just too far. BAH! Good luck on the job hunt. My hubby lost his job in 7/13. Took him 9 months to find another one. But he did. A better one, less stress and no travel. God is good. Wow, this looks like a really great stash...and I seen so many pieces I'd love to have. Why not think about doing a vintage sale like Anne does, geez I'd head out for ya! Good luck with the job hunt...I hope he finds something soon. aww, if I only lived closer, I would arrange it all in your pretty yard and I would host the Vintage Junkque Sale for you and we could have a little Lemonade (or Margarita) Stand and I'd make some killer Brownies and we could serve the buyers as they `shopped your wonderful stash. Good good luck...bet she will take it all. And I do pray that your sweetie finds a job soon. Kris, I see lots of wonderful things to love. It's probably a good thing I live in Florida because my storage room is bursting at the seams. You could open your own store, and it would be filled with good stuff girl. I say while it's all laid out put a quick sign in the yard ands sell, sell, sell. There's too much good going on there to go to GW. I have torn feeling. I wish i lived near you so i could shop your lawn but at the same time, i feel sorry for your loss! Such beautiful pieces to have to part with. Good luck with everything. Oh Kris if I lived near you I'd be bringing a cube van over a buying the whole lot. I've got goosies just looking at the pictures of all those fabulous treasures! Girl you could make a small fortune selling these on Etsy. Looks like alot of treasures Kris.......good luck! AWESOME JUNK! 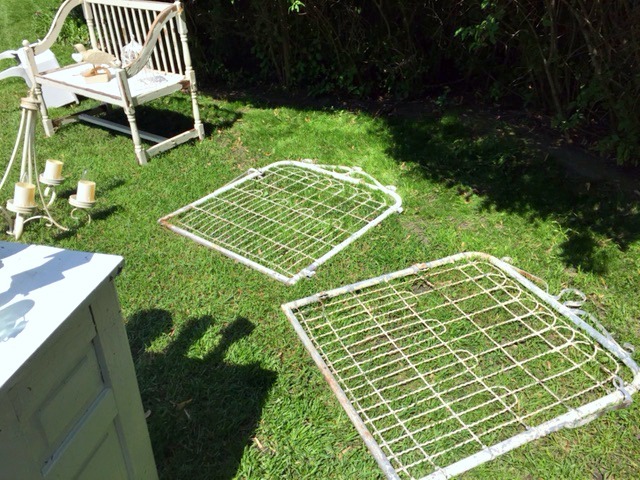 I looked and looked a couple of summers ago for gates like those two....make great trellis. I'd say Lucky Junk owner is now Lucky Janet! You have a generous heart to go along with your generous stash of good junk. Oh my, I LOVE so many of your items and if I lived there (I am in Oregon) I would buy lots of it! I am sure she will sell it quickly so hope you get a percentage! Wish I would find things like that! I look at all your beautiful treasures with such mixed emotions. Would I love to have almost anything, if not everything? In a split second I would. But I know what it is like to have to let go of a prized collection. At least you know there are many people who would love them as much as you do! And I always rationalize it by reminding myself there are so many other treasures yet to be discovered, so however things shake out you will always have a new opportunity around the next corner. Thank you for all the inspiration you share, it is a precious gift! Wow. I would love to get some of your junk. Fabulous stash.